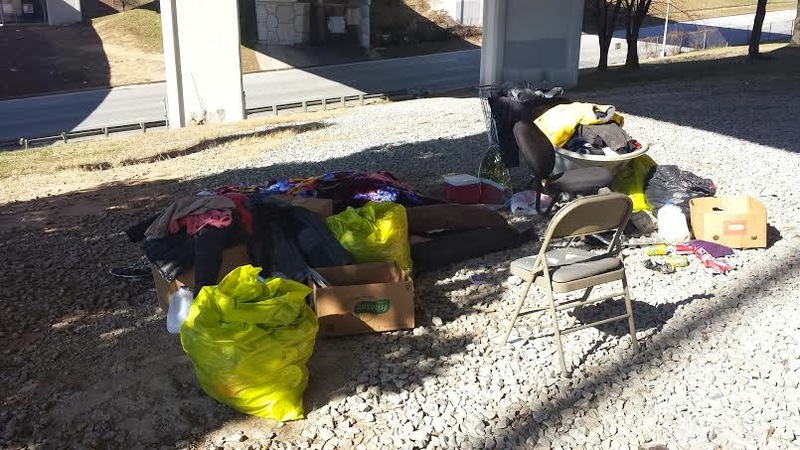 Last week after reading the Atlanta Progressive News articleon the bulldozing of a homeless tent city on the south underpass of I-20 and I-85, the Atlanta Economic Justice of the American Friends Service Committee had to respond. 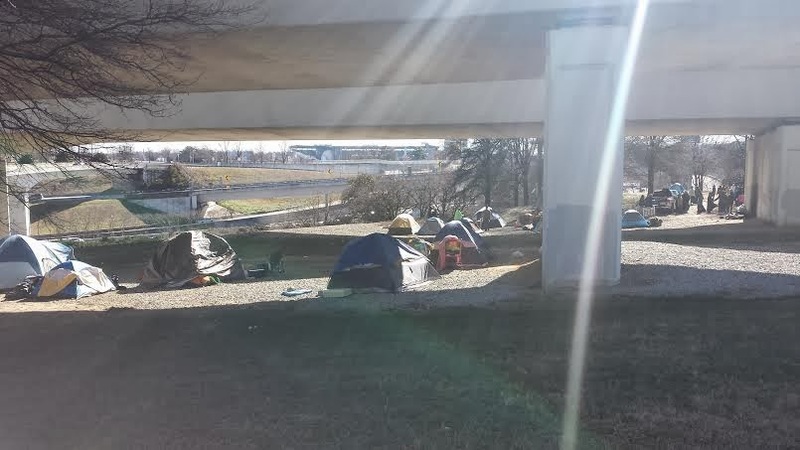 Many in the city have seen the tent city, which has steadily grown over the last year. After spending the day with the community last Sunday I learned that they have been bulldozed several times in the last year and police have arrested folks. Many of the folks that live down there have lost jobs in the last 12 months and ran out of money, without a safety net they lost their housing. I’ve been down there several times since and it’s clear that they have a real community. People in the tent city seem to get along very well, describing the their community as a family. 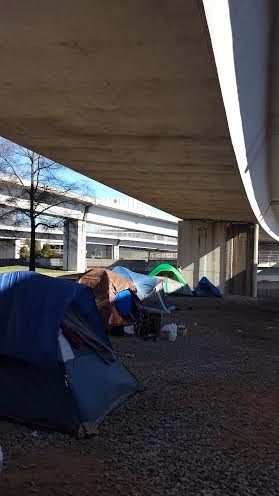 The city and the GDOT continue to clear out the tent city, and the community members continue to set their camp back up. When I asked why folks keep setting up the camp they all gave the same answer, they have nowhere else to go. With a riding homeless population the city’s shelters are busting at the seams, and many shelters are extremely temporary. AFSC plans to continue to engage with the community and pull in key partners to help address the needs of folks in the tent city. If you can make a donation please bring it to 60 walton, Atlanta 30303 between 10am-4pm or email scapatlanta@gmail.com. Yesterday the American Friends Service Committee marked the Martin Luther King holiday by working with the Moral Monday Georgia Coalition to organize a contingent in this year's march to focus of pressuring Governor Deal to accept Medicaid expansion in Georgia. 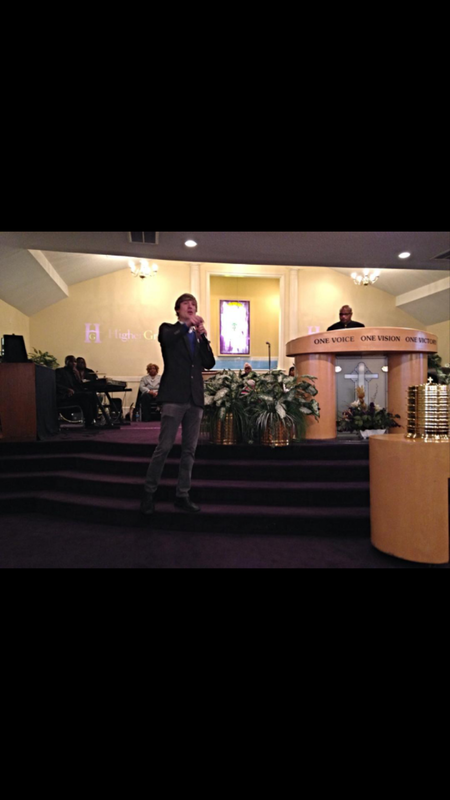 The contingent was big, energetic, and committed to building people power through the Moral Monday Coalition. Thousands of fliers for Moral Monday Georgia's next action at the capitol were enthusiastically passed out yesterday. Medicaid expansion would mean health coverage for 650,000 uninsured Georgians and 70,000 new good jobs in our state. It's estimated that Georgia loses $93 a minute as a result of Governor Deal's choice to not accept Medicaid expansion. Link to Facebook event for next Moral Monday action. After over a year of pressure from grassroots organizations like Occupy Our Homes Atlanta, former head of the Federal Housing Finance Agency (FHFA) Ed DeMarco has been fired. There’s a new boss overseeing mortgage giants Fannie Mae and Freddie Mac, and his name is Mel Watt. 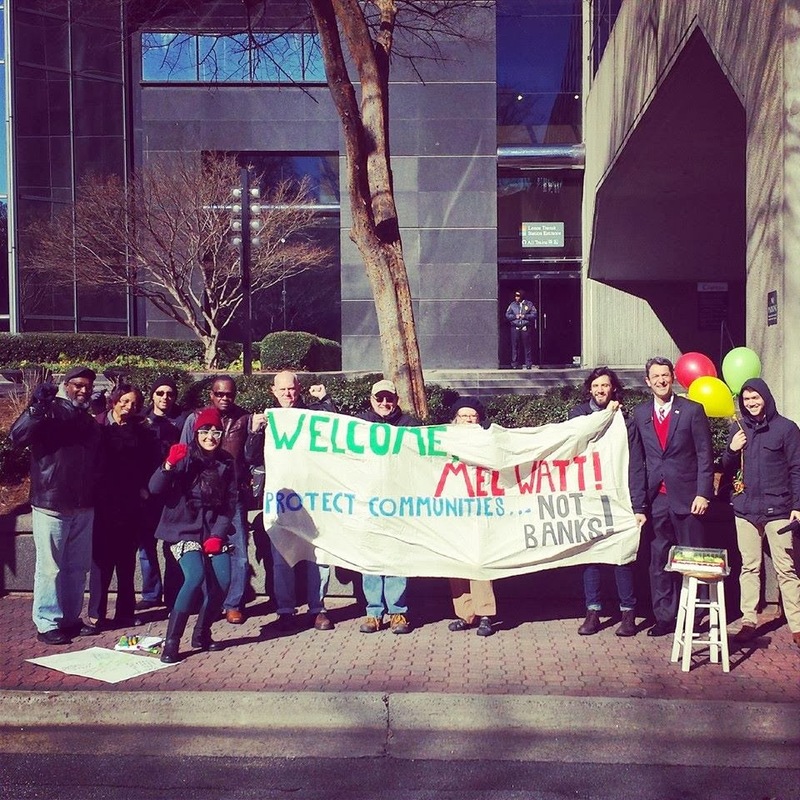 Today American Friends Service Committee joined members of Occupy Our Homes Atlanta, including struggling homeowners Zannie Jackson and Nancy Daniell who are facing foreclosure at the hands of Fannie and Freddie respectively, in throwing a welcoming party for Director Watt at the Atlanta regional office of Fannie Mae. 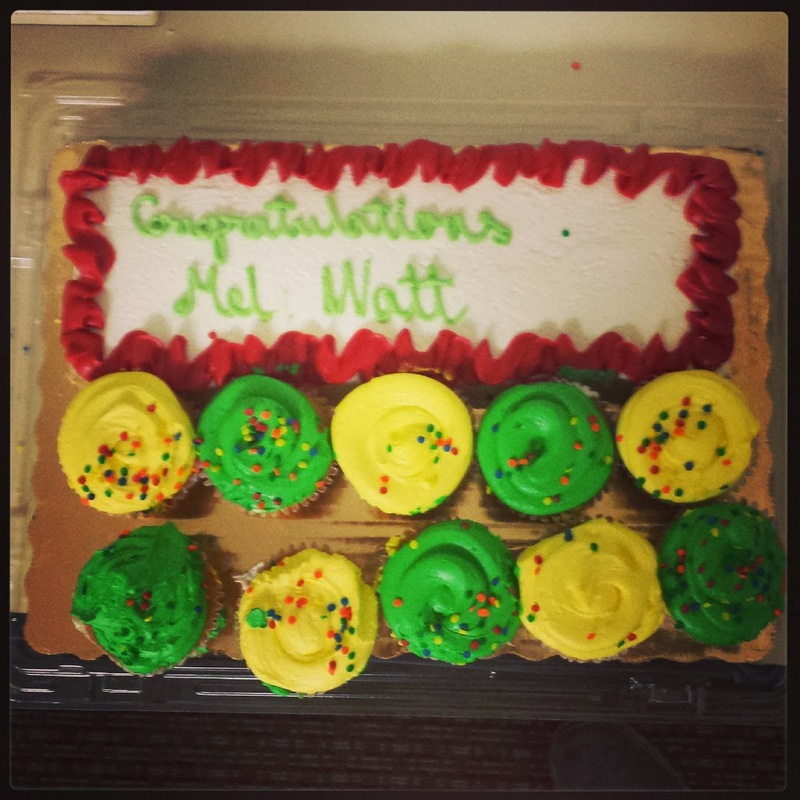 Like any good party there was cake, balloons, and even a great big greeting card for Mel Watt. Residents and community members spoke about Mel Watt’s potential to help communities around the country, and what we believe should be his main priorities at the FHFA. We know that Mel Watt has the potential to be a great community partner and work to keep people in their homes. However, we want him to know that we plan on holding him accountable every step of the way. While Mel Watt has already taken steps to distance himself from DeMarco, we want to make sure he starts working on the things communities need right away. Mel Watt has the power to relief struggling homeowners of dept that insures loans will remain underwater for years if not forever. We hope that Watt will also turn over vacant properties to community groups to be used for affordable/transitional housing units. As city's like Atlanta continue to see the number of homeless increase, it's painful to see empty homes in struggling communities. After we gathered in front of Fannie Mae's regional head quarters, signed our cards, and each shared our hope and dreams for Mel Watt, we decided it was time to deliver our giant greeting card, the cake, and the balloons! Zannie and Nancy also delivery copies of their online petitions to save their homes. Well, it turns out the surprise was on us! Fannie Mae decided to tell the private security force not to allow us in the building, and not to accept our greeting card. Never ones to leave the job undone, we simply went around the side of the building and delivered our package at the building loading dock, where it was gladly accepted! Please sign Zannie Jackson and Nancy Daniell's online petition's by clicking on their names. On January 1 of this year, Susie Johnson turned 79 years old. Her family should be celebrating this milestone and the start of a new year, but instead they're fighting Jp Morgan Chase to keep a roof over Grandma Susie's head. Last week, Ms. Johnson received a notice from Chase Bank, offering "cash for keys" to get out of her home of over 20 years. Now that they have settled with the Department of Justice for $13billion for their role in the housing crisis, it seems like Chase Bank thinks they're off the hook and can continue to put people like Susie on the street. Well not on our watch. 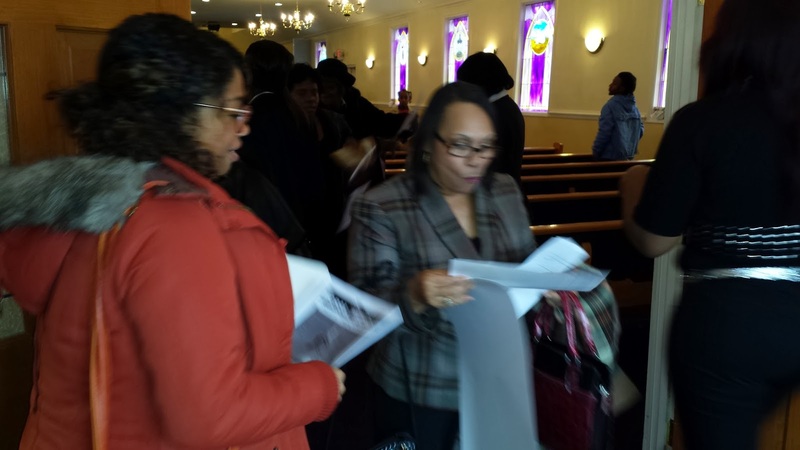 Today, in honor of Dr. Martin Luther King Jr.'s birthday, Grandma Susie's supporters will delivered her petition -- signed by over 6,000 of you -- to Jp Morgan Chase headquarters in New York City, as well as to Chase Bank branches around the country, but we still need your help. In Atlanta a group of us walked inside Chase bank and refused to leave until the manager agreed to accept the petition, then we passed out flyers to folks outside asking them to help us save a Grandmother from being evicted at the hands of Chase Bank. Will you stand with Grandma Susie and help make sure the message gets heard? "Hello, my name is (your name) from (city and state), and I'm calling to demand that you stop the eviction of Susie Johnson, who lives at 470 Meade St in Orange, New Jersey. Susie is 79 years old, and never missed a payment before being foreclosed on, but now your bank is pushing to evict this senior citizen from her home. $13billion dollars isn't really relief if it's not helping to keep people like Susie in their homes. Stop the eviction and work out a deal that keeps Susie Johnson in her home for good. It's time for JP Morgan Chase to do the right thing -- halt foreclosures and negotiate with families to help restore the home equity and community wealth their reckless actions have destroyed. We know that together, we hold the banks accountable and make sure they relief is getting to the people that need it the most. Please sign and share the online petition here. 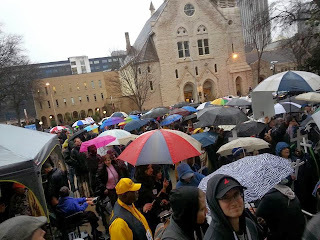 After more than four months of long meetings, countless hours devoted to phone calls to organizations all over Georgia, deeper coordination than I’ve ever see between groups that normally don’t mix, visits to over 60 churches, and lots of tasks completed by countless people, the MoralMonday Georgia movement was launched yesterday in the pouring rain. Many of us were inspired by the Moral Monday movement inNorth Carolina. 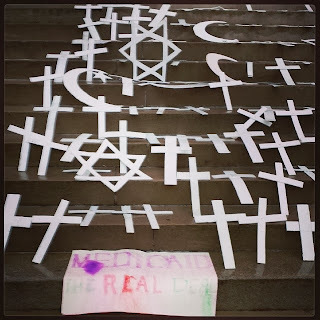 For the first time since the Occupy movement, we were seeing folks let go of organizational identity to work under one banner around a number of important issues that all had clear intersections; but Moral Monday was different from the Occupy Movement. The Occupy Movement never intended to have a clear goal for every action, every march. The Occupy movement forced a much needed spotlight onto wealth disparity; it changed the national conversation, and has brought more awareness to corporate corruption. It certainly can be said that Occupy planted the seeds that eventually landed historic settlements between the big banks and the federal government with more to come, though certainly not enough. What we saw in North Carolina was different. Although the movement had clear broad aspirations and clear intersections between many issues, it seemed from the get go that Moral Monday intended to directly challenge legislation that hurt people in their state. Every week we heard of a new piece of terrible legislation that they were fighting, and boy did they seem committed. Every week it was another mass demonstration with principled nonviolent civil disobedience, week after week after week. 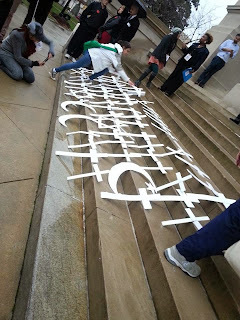 Almost 1000 people were arrested through the course of North Carolina’s legislative session. By the end of last year what North Carolina had built began to look like what could be a new southern strategy, like one we haven’t seen in my lifetime. It’s highly organized and disciplined, but also very diverse and inclusive, it sees all the issues as connected, but understands strategy and aims to win real victories, the movement seemed media savvy and continued to do what folks least expected, the movement intentionally targeted their state budgets and policies; understanding the organizations like the American Legislative Exchange Council (ALEC) have been quietly targeting state houses for decades. In Georgia we were paying attention, some of us even took road trips to North Carolina. Over the summer last year folks from Occupy Our Homes Atlanta lead a campaign to stop Desert Storm Veteran Mark Harris from being evicted from his home at the hands of housing giant Fannie Mae. On Mark’s eviction day dozens of us converged on his property and stood with Mark, refusing to leave until Fannie Mae made a fair deal with Mark. We set up a camp in Mark’s yard and late into the evening we began to talk about Moral Monday and the Dream Defenders, we talked about the need to build bridges between all the amazing organizing in our city, to build the movement that intersects all our work. 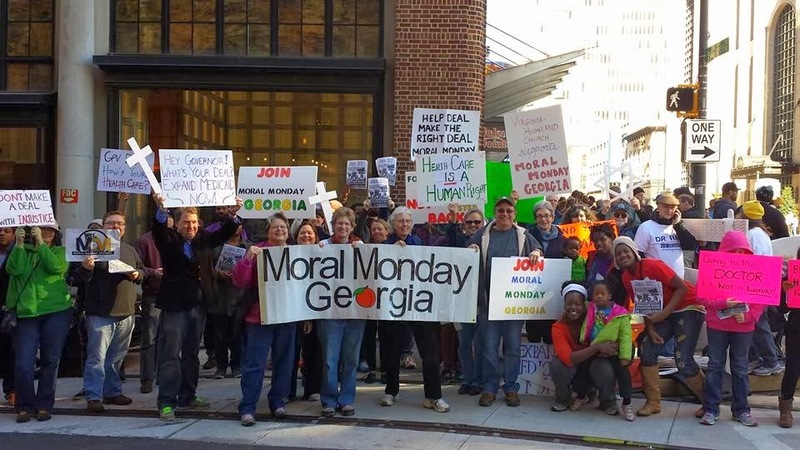 It was in that late night that we first began to talk about what the Moral Monday movement would look like in Georgia. We lost Mark’s home, but the resistance of his wrongful eviction spark the first Moral Monday planning meeting and over the course of the last four months we’ve built an exciting diverse coalition that includes over 50 groups. Yesterday we launch our first ambition action, the issue of the day; Medicaid expansion. Though there are dozens of policy issues we could have focused on nothing seems more urgent, nothing seems to cut to the core of our state’s crisis of moral priority then our Governors decision to block 650,000 struggling Georgian’s from receiving healthcare and 70,000 good jobs to our state. The cruel irony is that as of January 1st Georgians are paying for folks all over the country to receive lifesaving healthcare, yet Georgians are refused, per Governor Deal’s decision, the very same healthcare. 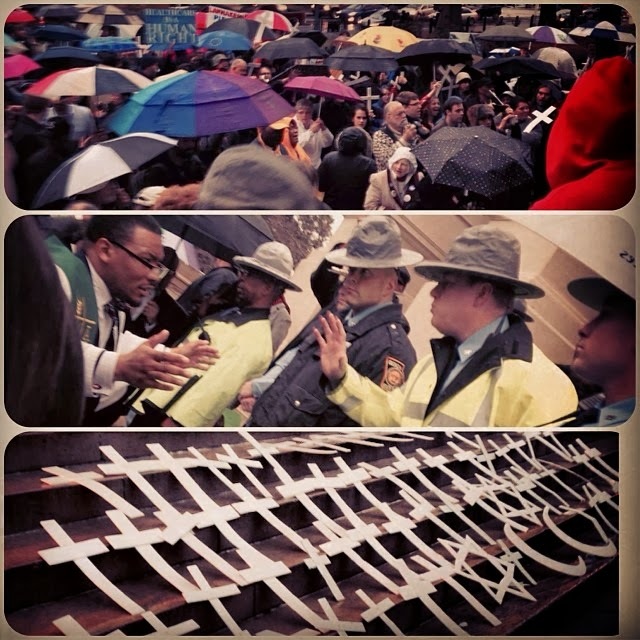 Yesterday Moral Monday demonstrators have a presence at the Capitol all day. Around 100 people showed up to lobby their representatives on the first day of the legislative session and through many of them were able to talk with the person elected to represent them, most were refused a meeting. 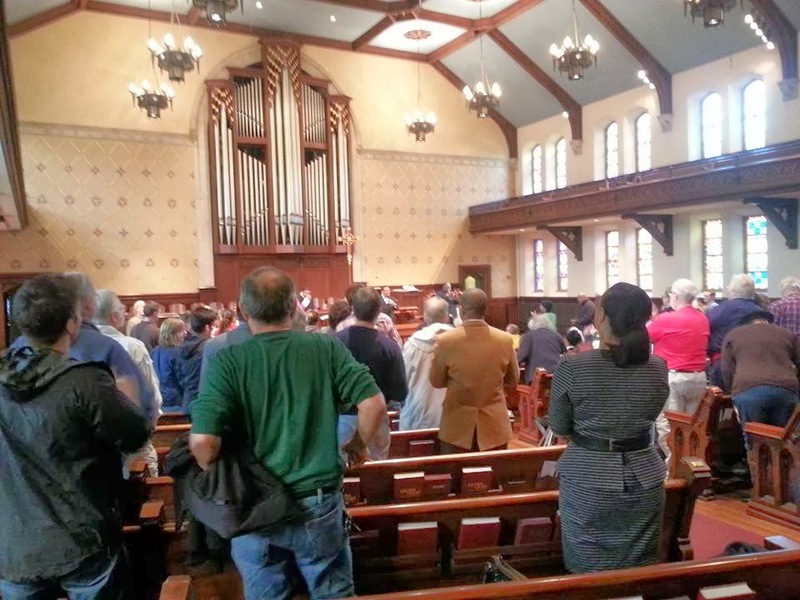 In the early afternoon Central Presbyterian, the church directly across the street from the Capitol, hosted a two hour workshop led by Rev William Baber who’s a leading voice in the movement. Despite the constant pouring rain 500 people came out in the rain for a rally on the steps of the Capitol. After the crowd heard from clergy, doctors, community leaders, and the uninsured folks that would benefit from Medicaid expansion, a solemn precession was led by faith leaders up the stairs of the capitol. Everyone took their turn to walk to the steps of the capitol and lay down a religious symbol, each symbol represented a Georgian who will die this year because Governor Deal refuses to accept Medicaid expansion. After a brief tense moment with police, many at the rally chose to join clergy in walking all the way up to the steps and placing their hands on the door of the capitol. The message was clear; this is life or death for Georgians. 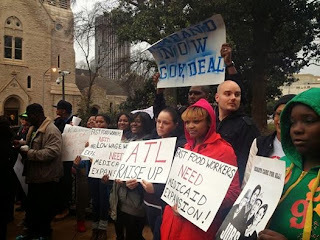 The struggle to bring healthcare to Georgians is one the Moral Monday Movement will continue to engage in. Next week Moral MondayCoalition members will march in the MLK March on the 20th, and we will be back at theCapitol January 27th to either celebrate Governor Deal’s decision to do the right thing or escalate the campaign using creative, disciplined nonviolent direct action. Yesterday former congressman Mel Watt took office as the head of the Federal Housing Finance Agency (FHFA), which oversees Fannie Mae and Freddie Mac. Today, Fannie Mae is taking four people to court with charges of criminal trespassing for working peacefully and nonviolently to keep Desert Storm veteran Mark Harris in his Avondale Estates home of 16 years. Under the direction of Ed DeMarco, the former interim director of the FHFA, Fannie Mae refused principle reduction to current market value for many struggling homeowners like Mark, resulting in an unprecedented rate of foreclosures across the nation. Instead of helping struggling homeowners, Fannie Mae chose to waste public tax dollars on expensive eviction procedures. In August, Fannie Mae had Mark Harris evicted at gunpoint at spent tens of thousands on 24/7 private security. This money could have gone to helping Mark work out a deal he could afford. Fannie Mae is now set to spend even more taxpayer money to prosecute four people that, along with over ten thousand people who have signed petitions supporting Mark Harris, didn't want to see another veteran on the streets. In court today, the four arrestees plead not guilty to charges of criminal trespassing levied against them by Fannie Mae, forcing Fannie Mae to justify their actions in a court of law. Fannie Mae, under the direction of Mel Watt's FHFA, has a choice to make. We ask that Mel Watt direct Fannie Mae to drop the charges against our peaceful and nonviolent arrestess who fought to keep a veteran housed and save American taxpayers and homeowners billions by correcting mortgages to current market value. We are grateful for the legal assistance from the Davis/Boazman law firm who continues to tirelessly step up for the Atlanta community good over and over again. Right now in Georgia, wealth disparity has never been worse. Our budget and its tax breaks have never benefited those that already have much more than they would ever need at the cost of folks that are already struggling to keep their head above water, while the number of those forgotten by our system and relegated to the streets or incarceration continues to grow at an alarming rate. The Moral Monday movement captured the nation's attention last year in North Carolina as a diverse coalition from the state decided to put their bodies on the line to resist an extreme agenda aimed to stripe the state of voter's rights, worker's rights, women's rights, and programs of social uplift. As months have passed momentum has continued to grow in North Carolina and what looks like a real southern strategy to address historic wealth inequity has emerged. The movement is growing, and it's coming to Georgia on the first day of the Legislative session January 13th for an all-day event that will include lobbying legislators, education, and a powerful rally at the steps of the Georgia Capitol from 4-6pm. On the 13th, the issue we will focus on in Georgia is Medicaid Expansion. Our Governor has decided not to sign off on Medicaid expansion on purely ideological grounds, essentially refusing free resources. What does this mean for Georgia? It means 600,000 Georgians will go uninsured, and we will not get the 70,000 good jobs Medicaid expansion will bring. Governor Deal’s commitment to rich people will cost lives in Georgia. The conservative estimate is that 1 out of every 1,000 uninsured people will die a year due to lack of health insurance. That means at least 600 fatalities this year. 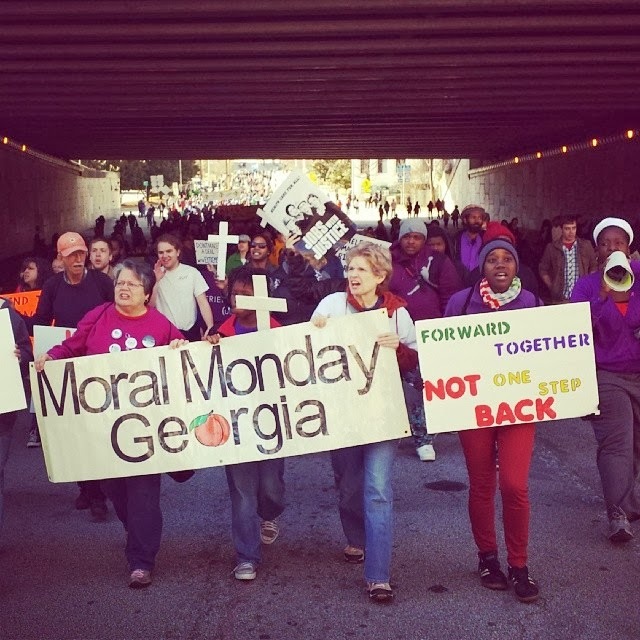 In an effort to build momentum for the Moral Monday movement, and the passage of Medicaid expansion, over 50 Georgia Churches spread the message of Moral Monday through their congregations. I had the pleasure of attending and speaking at Higher Ground Empowerment Center in the historic Vine City community as part of the effort and the reception was more than positive. It was also very exciting to know that 50 other Georgia Churches where receiving the same message. Everyone knows and loves someone that simply can't afford healthcare. Our state budgets can no longer be ignored. We must begin to look at our budgets as a list of moral priorities. We must take a hard look at who is prioritized, which communities benefit year after year, and which communities are left behind to fall behind more as each year passes. Click here for more details about Moral Monday's January 13th action.